Jody first came to Safelight's shelter at the recommendation of the DSS and law enforcement. Now in her thirties, she had spent her life in abusive relationships. She entered shelter pregnant and with a four-year-old son. Jody left everything she owned with her abusive partner, and was literally starting over. Jody had no job, car, or daycare, and was on Work First. Approved for Safelight's transitional housing, Jody said with tears in her eyes, "It was such a blessing to have a home to bring the new baby." Jody then qualified for Section 8 housing and was able to move into a permanent home. She participated in Safelight's support groups and counseling. "I have learned so much about the warning signs of abuse, and about how to become empowered. For the first time, I have the self-esteem to know I can do things by myself." With the guidance of case management, many of Jody's obstacles and barriers have been overcome. 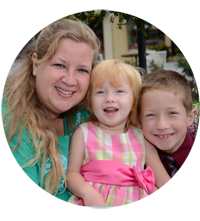 Jody's children are now in school and Headstart, and she relied on Safelight's daycare when school was closed. Jody joined Safelight's training program for the Dandelion Eatery; the first job she had had in four years. "I have gained so much knowledge from the staff and the Blue Ridge College Program. I feel so thankful and blessed." Jody says. "I have been helped by so many people. I hope someday I will be able to give back to the community."